​The North Country Cheviot – a big, long, rugged white sheep which combines thriftiness and healthiness with prolificy and strong maternal qualities. It is the largest of all the UK Hill breeds and is particularly suited to grassy hills and uplands, though will adapt to most environments. Most North Country Cheviot ewes are bred pure and there is a keen demand for all classes of pure bred stock – rams, ewes and lambs. North Country Cheviot ewes, found on some of hardest ground in the country, are particularly kind mothers, easy to handle at lambing time, with very few lambing problems. They can produce quality lambs under the most rigorous and demanding conditions and are noted for their longevity. Draft ewes are sold to lower ground farms at about five years old and consistently prove great performers, producing another two or three crops of lamb. North Country Cheviot ewes thrive in a wide range of grazing conditions. On marginal and low land she has traditionally been crossed with breeds such as the Border Leicester to produce Scotch Half Bred or the Bluefaced Leicester to produce the very popular Cheviot Mule. North Country Cheviot Rams have consistently proved their worth as crossing sires. The different types of North Country Cheviot ensure that crossing rams are available to meet most conditions. Another important factor of the breed is their working lives are considerably longer than most other breeds. The attraction of the North Country Cheviot (and NCC cross) lamb for finishers is its ability to retain leanness and conformation at a wide range of weights. It is suitable for both short and long keep finishing systems and can provide a carcass of the highest quality. The North Country Cheviot – a long-established native breed which thrives in all parts of the UK – is the complete all-rounder and has truly stood the test of time. An extremely versatile sheep, it continues to play a leading role in the UK’s sheep industry because of its carcase qualities and its versatility – it can be used successfully in a wide range of breeding programmes. The popularity of the breed continues to grow – a testament to its proven track record of producing what` the market demands – quality and value without compromise. The North Country Cheviot can be bred pure or crossed to advantage with many other breeds to produce top quality prime lambs. The ‘Northie’ is used more extensively and to greater effect in crossing programmes than any other hill breed, particularly in hills and uplands. In both store and prime markets North Country Cheviot and North Country Cheviot cross lambs constantly gain higher prices than other hill breeds. As a result of this premium more and more producers are using North Country Cheviot rams on their hill ewes to increase returns. On lower ground many prime lamb producers are finding that using breeding ewes such as the North Country. Cheviot Mule and Texel X North Country Cheviot ewe adds extra quality to the finished lamb – superior conformation and all-round finish. 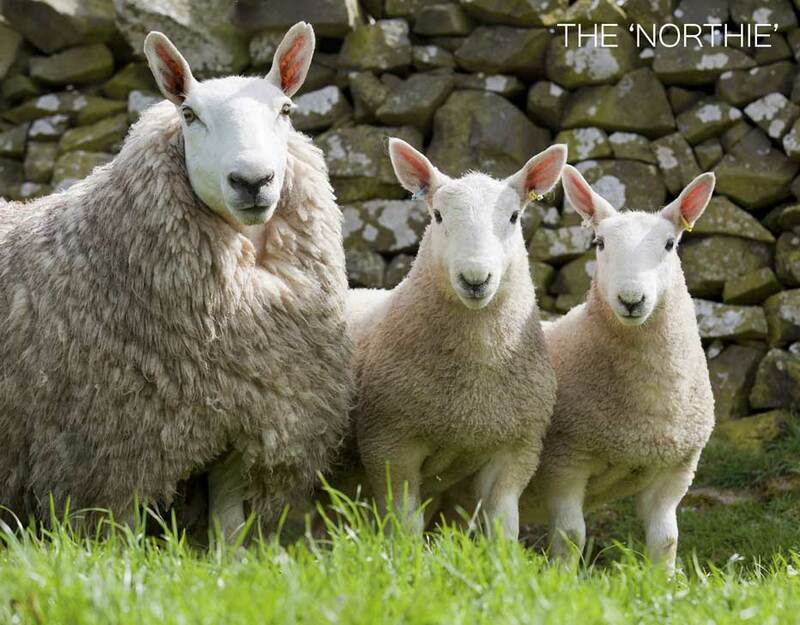 North Country Cheviot ewes are being crossed successfully with terminal sires such as the Texel, Beltex (in the UK), Suffolk and Charollais to produce top-class, fast growing prime lambs. Producers are finding these lambs to be particularly vigorous from birth, requiring little intervention and finishing earlier than other breed, therefore costing less and increasing profit. This breed description and header picture were blatantly stolen from http://www.nc-cheviot.co.uk Please go there for more in depth information on the breed. Thank you Alison Brodie, breed secretary, for your understanding. ​​General Appearance: ​Medium sized, deep bodied, hornless, and a white fleece with a good staple.